Even if you’ve never been inside an RV but intend to go on a road trip soon in one, your iPhone should come in handy thanks to the growing popularity of app development for iPhones. With so many apps already available to help you on the road and to make RVing a lot simpler and more convenient, there’s nothing to stop you from taking the road less traveled in your RV. A good RV GPS app for iPhones should be relevant to RVing and camping, in addition to being reliable and current. This ensures genuine bang for the buck and saves you time and money on fuel better spent for really fun adventures and not on going around in circles in unknown territory. This app provides a trustworthy route designed for driving a recreational vehicle while helping you stay safe on the road. Engineered for Apple iPhones or iPads along with Android tablets or smartphones, the app creates reliable RV-geared routes for US and Canada use. It enables you to avoid low tunnels and bridges as well as restricted areas when traveling in your RV. From the same developer of the popular SmartTruckRoute, this app allows you to modify the parameters in the vehicle settings section according to your type of RV. You can stay away from roads that prohibit RV driving, with minimal use of data on an internet connection. With mapping and routes updated daily, the app provides the best possible navigation and routing. 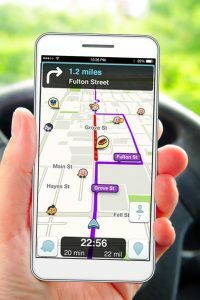 Powered by WorldNav, the app offers turn-by-turn directions and the latest RV-specific routes and maps. You can opt to navigate in either Satellite or Street view or use your phone’s built-in speaker to say the address of your destination. Within seconds, a RV-specific route is presented to you so you can avoid low bridges and use only RV-friendly roads. The other functions of your iPhone do not get interrupted so you can still do simultaneous communication and web surfing. The NEW iPhone X has a great price on Amazon.com. Click here to see their offer! Take the more scenic route every time with the CoPilot app on your iPhone. This state-of-the-art RV navigation app offers real value for money while catering to the specific needs of your vehicle, giving you the confidence to cross state borders when you please. It won’t cost you a thousand dollars to enjoy its myriads of benefits and features for overcoming all your RV and camping fears as well as high data bills. Offering reliable offline navigation, the app will not have you ducking in and out to catch a signal or waiting exasperatedly for an online navigation app to load up on which direction you are heading in. The included 12 months real-time traffic service enables you to skip unexpected delays on the way, helping you stay safe and stress-free. The app calculates your route based on the size and class of your vehicle so you won’t have to worry about costly and dangerous run-ins with low bridges. The ClearTurn™ view and lane arrows feature real road signage so you always know which lane to take for safe lane changing and maneuvering as well as taking complex intersections well ahead of time. The most accurate source of hyperlocal weather information, the Dark Sky app provides forecasts that are down to the minute so you’ll know precisely when the rain will start and stop exactly where you are driving. Employing state-of-the-art technology, the app predicts when it will snow or rain at your exact location, delivering hyperlocal forecasts not only for your state or city but right where you are at the moment.